I've admired this armoire from Tonic Home for several months now and I'm almost sitting on my hands so I don't whip out my Mastercard. Free shipping makes it even more difficult to resist and I'm afraid this may be a losing battle. 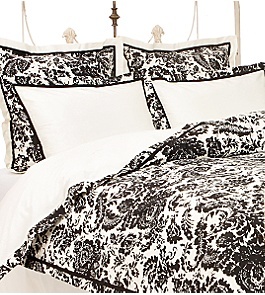 It would look just entrancing against the icy pale aqua of the bedroom, opposite the foot of the bed. 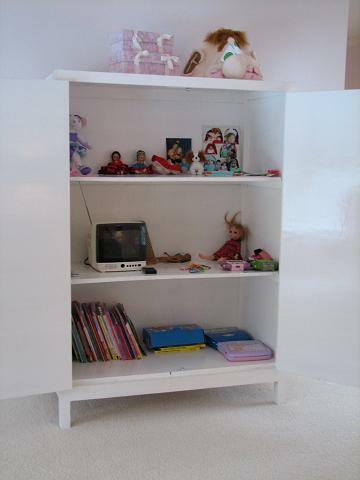 Now, when one's kids inherit furniture, wouldn't they be much happier to have something like this over some ugly dingy brown armoire that Aunt Agnes used for hiding bodies of her dead cats? Thinking like this makes it seem like a must have item! Last year I saw this pastel painting at the flea market but I thought they were asking too much for her. I went the next day and still the same price. I went again, this time in a disguise, and STILL the guy wouldn't budge, even after I explained that my husband was going to read Tolstoy out loud to me for a week if I didn't come home with it. Didn't impress him, he didn't budge at all. She was worth it - every bedroom should have a bit of naked sensibility about it. It came in this dirty frame and a few days ago I decided that it needed a few coats of bright white paint. I hung it in our bedroom which is pale aqual and still in design peril, but she looks smashing. Here is what was in the mystery package. 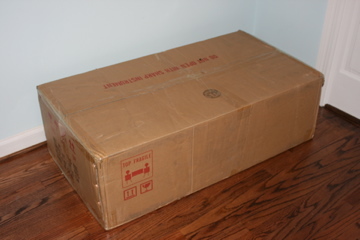 It is in the foyer awaiting its trip up to our bedroom. 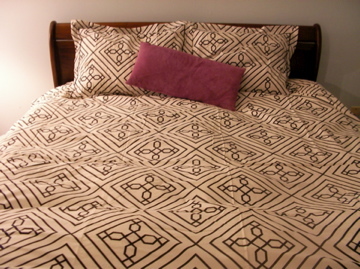 It is from JCP.com and I was pleasantly surprised at the weight and quality of it. I thought it might be cheap, thin fiberboard, but is impressively built. 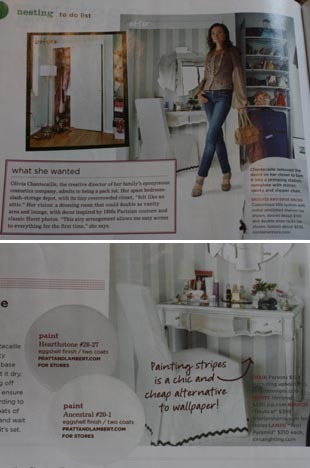 As some of you guessed, it was featured in the budget makeover of Olivia Chantecaille's closet in this month's Domino. 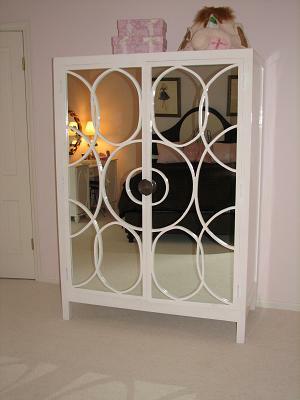 Imagine Olivia having a vanity from JCPenney! All it needs now is a little seat that will fit underneath (to keep the Sports Illustrateds from being "stored" there, since it will be usurping some important bedroom space.) A girl should always be on the offensive! The oil painting is another flea market find and I don't know where she will end up but until we decide, she lives in the foyer. Him: (Looking at scraggly hair pulled into a pony tail, eyes narrowed): Well, it's pulled back but it looks nice, honey. Me: OMG I can't believe you. Him: What? What is it? Me: Get back to me when you notice! I have been trying to push something mirrored like this in the entry along with some pretty wallpaper and he keeps campaigning for something like this. Nothing wrong with it, mind you, but just not my taste. 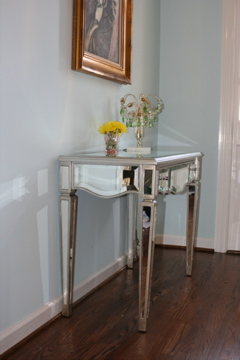 Now that he can see something mirrored in the foyer, which prior to this he was dead against, I may just have a chance! 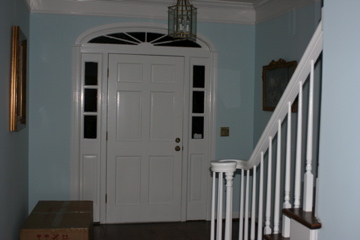 Here is my yet-to-be-redone foyer, which I insist on pronouncing "foy-YAY." Observe carefully. In the left corner is a rather large package. Can you guess what is in it? My Aga? No, that will be for another decade, after the medschool loans are paid off. A pool table? Husband wishes! A new mantle for the fireplace? No, we are going to stay with the restained cheap oak one. Me: Is this cheap crap or very beautiful? How can this be? Anna: You have to buy this. That price cannot be right - buy it before they're gone!!!!! Now had Anna known the store she might not have said this, but I believe she would have. I love that she understands that I need to look for bargains and that we are on a budget. She has impeccable taste but is in no way a snob. 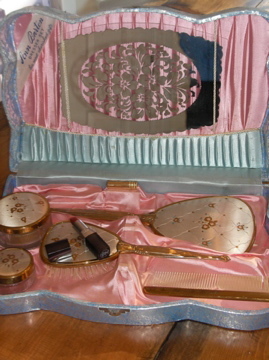 I think this lovely flea market find, which husband gave me for Christmas, will be perfectly accompany what is in that large package. He slipped in a painstakingly selected lipstick: Matador Red by Chanel. No silly matador comments, thank you!